Exactly one year and a day has gone by since I posted So Done with 2010! on January 1, 2011. We were ready to move on while we looked forward to a new year of good and positive things to come. The very next evening, January 2, 2011 I received a shocking and devastating phone call from my mom that my oldest friend, my BEST friend for many years, my “big brother”, had died that day. He committed suicide. So many lives changed forever. The day after Scott’s funeral I posted this. Now. Today. Exactly one year later, I am still heartbroken. Not a single day has gone by that I haven’t thought about him and the family and friends he left behind. I have been unsure these past weeks of how I could, or even should, post my reflections on all that has happened this past year and what we are looking forward too in the coming New Year. I will NEVER look to the New Year in the same way again. This past year we have surrounded ourselves with family and friends and I found many days filled with joy and excitement and hope. Through all of this, thoughts of Scott were always there…just knowing he was no longer here, changed everything. I feel things differently. More deeply. We will all move on with our lives. It will be hard but perhaps with time some days a little “less hard”. I know I will also move on to experience joy and love and hope even more so because I have learned, or at least I think I have learned, just how precious that experience is. My New Year is changed forever. And I am too. The American Foundation for Suicide Prevention (AFSP) needs us too. I wonder what important insight could we, as an Autism Community, provide for the AFSP? The anxiety and depression that a lot of our children experience, especially as they get older. The bullying, the inability at times to navigate our very social world, the isolation. The depression and anxiety and isolation that parents of special needs children can go through. Although my friend Scott’s story is completely different and apart from those in the Autism Community, it’s an interesting thought to me and perhaps a much-needed perspective…something to ponder this New Year. Yesterday we laid to rest a life-long friend and big brother figure of mine. No words can express the sadness and heaviness of loss that weighs on my soul. No words are great enough to truly pay tribute to the extraordinary person that Scott was or will remain in all of our hearts. Over the last several years, I let “life” get in the way and let my friendship with Scott slip away. I have carried that regret with me all these years, every year saying that this is the year when I will reconnect with my life-long friend. On January 2nd I received the horrific and devastating call that Scott had died that day. Now this year was too late. I don’t know of a world without Scott. I have always said that “he knew me before I was born”. I have a lifetime of memories growing up with him. He was a big brother and best friend to me. I have so many memories of Christmas days and New Years Eve’s, birthdays, Easter Sundays, countless camping trips and rounds of “spoons”, hiking, float trips, putting on silly skits, running the neighborhood, and riding in his cars. We shared family dinners; sometimes in celebration and sometimes just because it was supper time. We were also known to share breakfast and lunch for those same reasons. Scott gave me an appreciation of BB King, Stevie Ray Vaughn, Eric Clapton and Jimi Hendrix just to name a few. We made a lot of trips to Peaches Record Store. We had a lot of quiet times, just sitting together and listening to the music. I think of Scott every time I see an old Cutlass go down the road. I remember hours spent in Pat and Jack’s garage amidst a sea of car parts. And come to think of it, we made a lot of trips to Weiss’ Speed Shop too. We shared an appreciation of good food and I could always count on him to have some Tums ready after our many meals out together. I will also never forget those snake-skin boots he wore for while or the time he gave himself a black eye swatting at a June bug! I laughed so hard about that June bug only to do the same thing to myself a night later. That’s what I get, I guess, for teasing him so badly. Sure, we teased and taunted each other over the years. We argued too. That’s what siblings do. But we always made up. He was the sweetest, kindest, gentlest guy I have ever known. He let me be me and with him I always felt comfortable in my own skin. He made me laugh. REALLY laugh. He is the standard that every guy I ever dated had to measure up too….and quite frankly, most fell short…by A LOT. Regret grips my heart as I never did get a chance to tell him that I remembered all these moments we shared. I hope that somehow he knows and that he remembers too. I have to believe that he is at peace now. I will miss him so much. My world was and IS so much better because of Scott and I will hold on to him in my heart always. Rest in peace, my friend. February 8, 1966 to January 2, 2011. One of my favorite pictures. 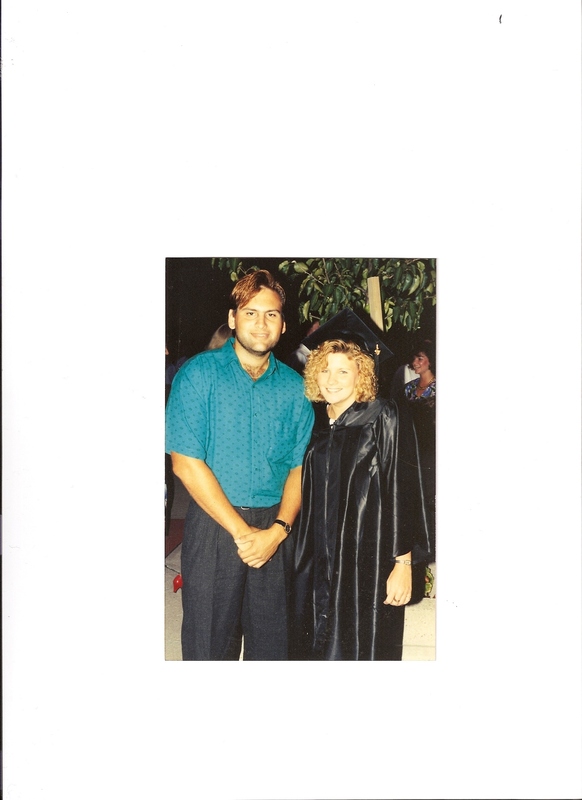 Scott and me on my college graduation day in 1991.